Sensing spirituality, or sensate prayer, concentrates on the here and now, unlike intuitive prayer that looks for the mystical in life. I confess that I honestly did not see the point of sensate prayer in the beginning, being a much more intuitive kind of person. However, now that I have experienced sensate prayer for myself a few times, I not only saw its relevancy and helpfulness in my walk with the Lord, but decided to develop a retreat session utilizing sensate prayer! This is a pretty big “leap of faith” for myself! In sensate prayer one gathers a variety of every day items that will appeal to all of your senses. In our HeartPaths group, we had aromatic spices to smell, semi-sweet chocolate to taste, sandpaper to feel, and shells to listen to, among other items. We were first directed to close our eyes and allow our senses to notice all the sounds, feelings, tastes and smells just naturally around us in our meeting room. 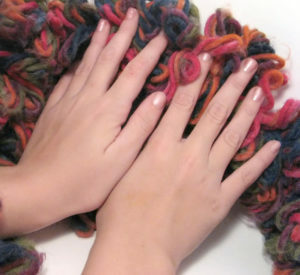 “I began my prayer time with touching the knitted/crocheted yarn. It was softer and much more stretchy than it looked. How often do I disregard or judge people based on appearances and not really understand what they are about? Then I smelled the cloves. It smelled sweet and pungent all at the same time. It and the spearmint oil remind me how I try not to smell what is around me because it often makes me sneeze or gives me a headache…. Then I had the dark chocolate. Again, it is sweet, velvety in texture, but also bitter. I realized that sometimes we have to encounter a person more than once to appreciate him or her fully…. As you go through your day this day and everyday, ask God to have the items around you teach you something by simply fully observing and experiencing everything about them. If nothing else, it may give you a new “yarn” to tell! This entry was posted on Wednesday, April 27th, 2016 at 12:17 pm and is filed under God stuff. You can follow any responses to this entry through the RSS 2.0 feed.